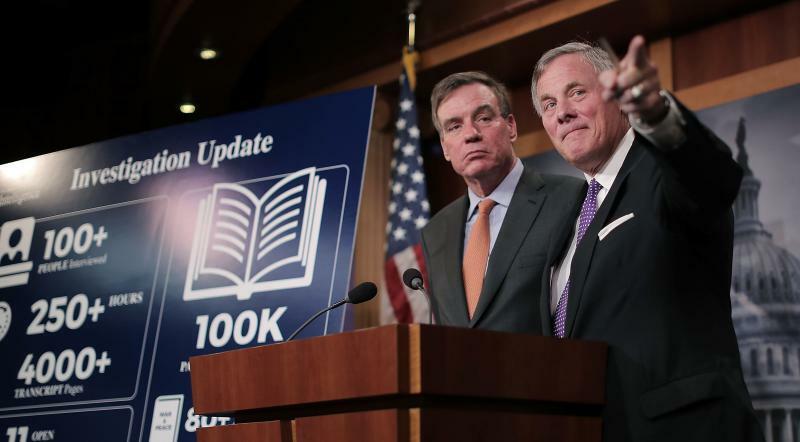 Senate Intelligence Committee Chairman Richard Burr, R-N.C. (left), and committee Vice Chairman Mark Warner, D-Va., discuss the status of the committee's inquiry into Russian interference in the 2016 presidential election, at the U.S. Capitol on Wednesday. This week in the Russia investigations: A progress report — sort of — from the Senate Intelligence Committee; Robert Mueller meets the author of the dossier; and Donald Trump Jr. may have a date on Capitol Hill. The leaders of the Senate Intelligence Committee wish you to know that they are still on the case investigating whether any Americans colluded with Russian influencemongers who targeted the presidential election last year. They do not, however, have any conclusions yet about that or other key questions. If their press conference on Wednesday was a report card, they would give themselves an "incomplete." The committee has some 25 more interviews scheduled for this month, plus about 100,000 pages of documents to go through. It has scheduled at least two more open hearings, one with longtime Trump attorney Michael Cohen and one with social networks. The committee has reached a "logical end" to the matter of President Trump's firing of FBI Director James Comey. Burr seemed to suggest that if there is an obstruction of justice case to be made, that is somebody else's business — perhaps the Senate Judiciary Committee and certainly Justice Department special counsel Mueller. Russia's campaign of "active measures" against the West didn't stop on Election Day last year, Warner cautioned. It continued through the subsequent European elections and right up to now, as we've seen. What does it all add up to? 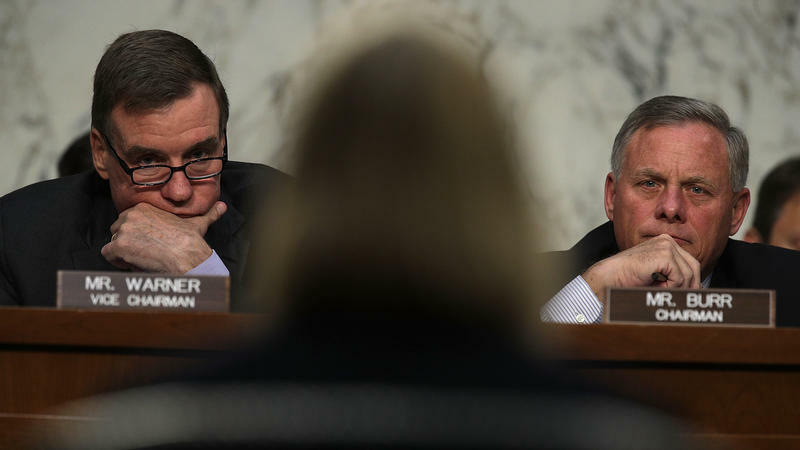 A couple things: One, the Senate Intelligence Committee will issue some kind of report at some point, Burr said, but he doesn't know when. And two, Congress and the states must continue expecting and preparing for election operations at least against this year's state elections in Virginia and New Jersey, next year's congressional midterms and then the 2020 presidential race. Investigators working for Mueller met over the summer with the former British intelligence officer behind the infamous, unverified dossier about Trump, CNN reports. You remember the dossier. NPR has not detailed its salacious allegations because they remain unconfirmed, but it contains claims that could leave Trump open to blackmail and describes alleged contact between members of his camp and the Russian government. The file was assembled by a former officer in Britain's secret intelligence service, Christopher Steele, and paid for by political campaigns in the U.S. that wanted "opposition research" for use against Trump. Their precise identities remain unknown. "U.S. investigators have corroborated some aspects of the dossier, specifically that some of the communications among foreign nationals mentioned in the memos did actually take place." Members of Congress are considering new legislation that would toughen the requirements for foreign-bought political ads like the one used by Russian influencemongers last year, Politico reports. 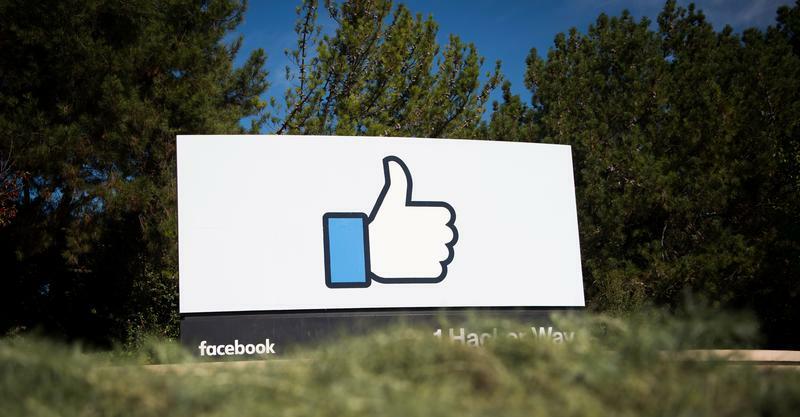 Combined with policy changes that the big social platforms say they'll make on their own, the idea is to at least increase the disclosure associated with PR campaigns in the future. 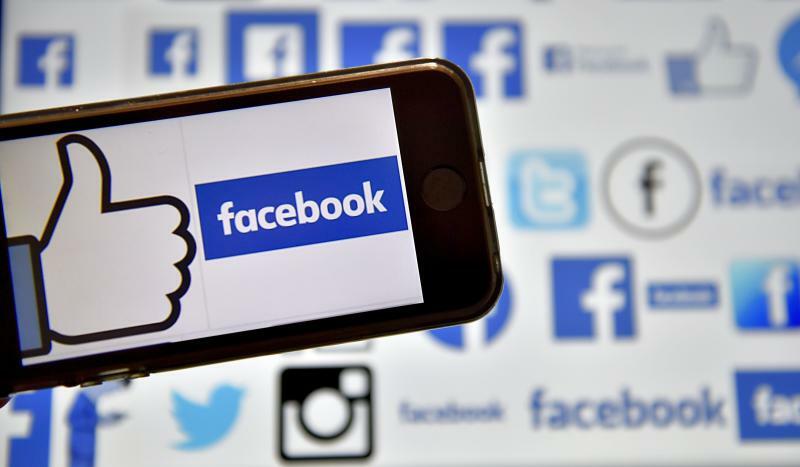 "Cracking down on social media companies would allow lawmakers to show they are getting tough on preventing meddling in the 2018 midterms even before multiple investigations into Moscow's 2016 interference conclude. For Republicans, it offers a potential opportunity to respond to Russia without hitting President Donald Trump." The specifics of a bill are still under discussion, and any vote is probably a long way off. Plus there is no guarantee that new restrictions about disclosures would restrain the efficacy of a big PR campaign by a foreign power or anyone else. Donald Trump Jr. may not be able to escape an open hearing before the Senate Judiciary Committee, its chairman said this week. Iowa Republican Chuck Grassley cited the desire by the panel's top Democrat, Sen. Dianne Feinstein of California, as a near-guarantee that they would agree to call Trump Jr. back to the Hill. More from CNN. Meaning what? Trump Jr. has already talked with congressional investigators behind the scenes, but he avoided the TV cameras and only issued a written statement. An open hearing would be out of his control: He might have to swear an oath to tell the truth, be subject to questions from Democrats and who knows what else. The White House probably wants to avoid that. 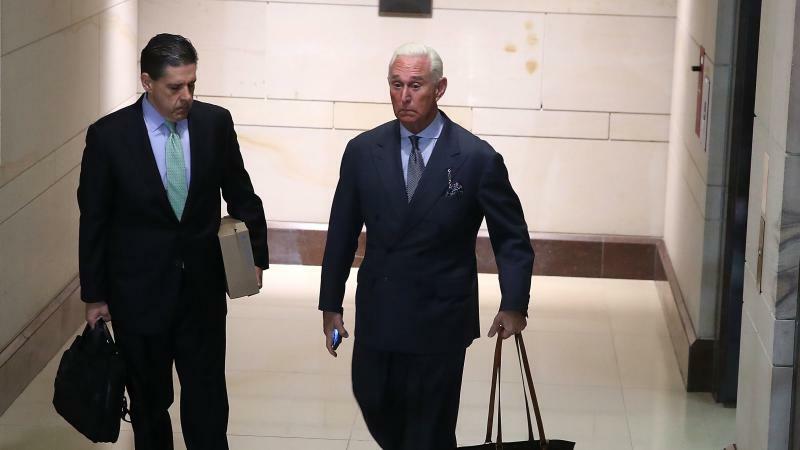 The two titans of social media said Wednesday that they'll send representatives to a Nov. 1 hearing before the Senate Intelligence Committee. Search behemoth Google, however, hasn't said whether it will accept the invitation from members of Congress. More from Recode. Meaning what? Big Tech is walking a tightrope. 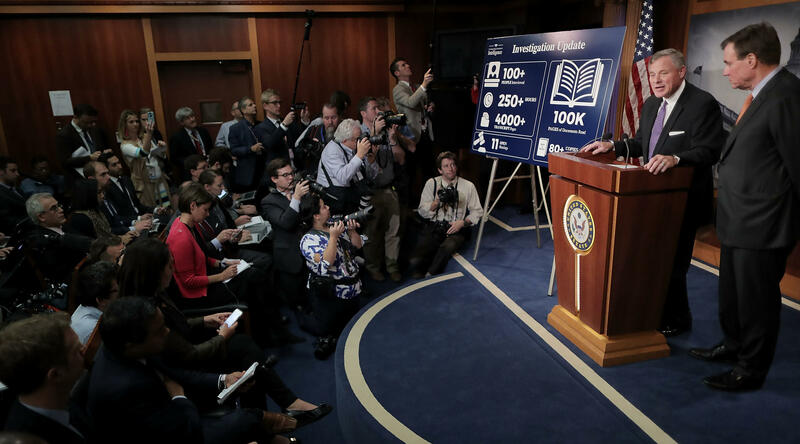 It wants to stay on Congress' good side, but these companies do not want onerous new regulation or legislation — and they don't want to be made the scapegoat for the way Russian influencemongers might have used their services. So although Facebook and Twitter say they'll send people to this hearing, it probably won't be their famous CEOs, and whoever does show up may well be on guard.